The Union Pacific Corporation, commonly known as Union Pacific, is a railroad holding company headquartered in Omaha. It is publicly-traded (NYSE: UNP) and included in both S&P100 and DJTA. 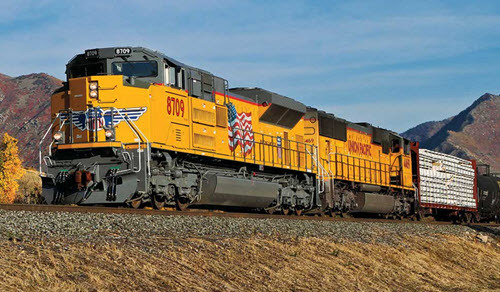 Together with its main competitor Burlington Northern Santa Fe, LLC, the Union Pacific Corporation has a duopoly on long-haul freight rail service in the Western United States. Union Pacific was headquartered in New York City from 1969 until the mid-1980s, when newly appointed CEO Drew Lewis relocated the corporate headquarters to Bethlehem, Pennsylvania. Another relocation brought the headquarters to Dallas, Texas, before it was time to move to Omaha, Nebraska to join the Union Pacific Railroad headquarters there. The Union Pacific Rail Road was created by the Pacific Railroad Act of 1862. Approved by congress and President Abraham Lincoln, this act form the corporation and authorized the construction of railway from the Missouri River to the Pacific. The railway was built from Council Bluffs, Iowa, to join the Central Pacific Railroad line going eastward from San Francisco Bay. When the Union Pacific Rail Road was finally combined with the Central Pacific Railroad, it formed the First Transcontinental Railroad and Overland Route. In 1880, the Union Pacific Rail Road was taken over by the newly formed Union Pacific Railway. In 1893, the company declared bankruptcy as a result of the Panic of 1893, a serious economic depression in the United States that began in 1893 and ended in 1897. The Union Pacific Railroad company was formed in 1897 and the Union Pacific Railway was merged into this company. This company proved to be more long-lasting than its predecessors. The Union Pacific Corporation was incorporated in Utah in 1969. This corporation was created to take control of the Union Pacific Railroad (later known as Mark I) and its subsidiaries.